WXXI's Beth Adams speaks to Holocaust survivor Steven Hess. Steven and Marion Hess (left) in Holland, and (right) re-enacting their January 1, 1947 arrival at New York harbor. A local Holocaust survivor says he has shared his story 50 or 60 times over the years, and he will do so again this week. 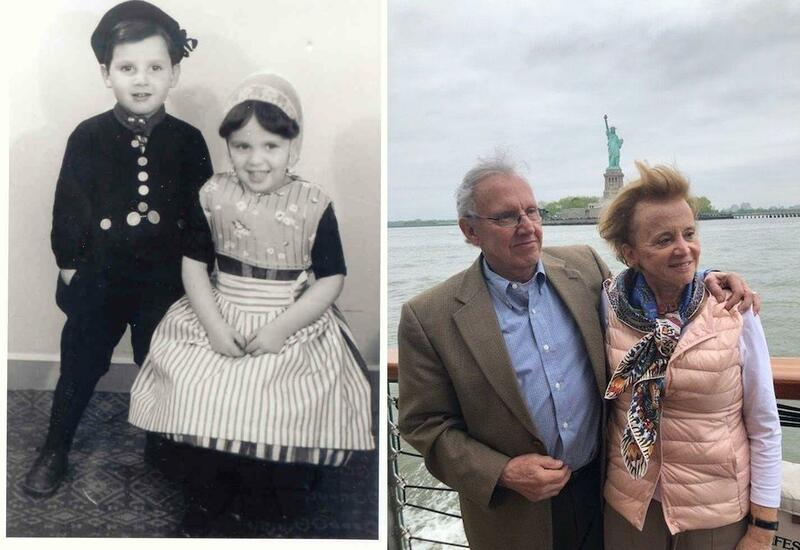 Stephen Hess and his twin sister, Marion, were just five years old when they and their family were taken by the Nazis in 1943. He said he didn't fully comprehend what was happening, but he does remember some aspects of the trauma. "At those ages, it was a matter of hunger and filth and discomfort," said Hess, "but we didn't have the psychological maturity to realize that we were condemned, so that, I guess, was a bizarre blessing." Hess and his family, along with hundreds of other survivors, were eventually freed by the Russian army as they traveled on a Nazi train meandering through Germany. They were placed on the train after spending two years in labor camps. After they were liberated, the Hess family returned to Holland before gaining visas to the United States in 1947. After settling in New York, Steven Hess graduated from Columbia College in 1960 and served in the Navy for four years. He moved to Rochester in 1975 and founded a photography equipment manufacturing business. Today, Hess urges people to recognize prejudice before it's too late. He draws a comparison between the Holocaust and 9/11. "Had I told that story (of the 2001 terrorist attacks) in class, not on 9/11 but on 9/10," he said, "everybody would have wondered what I'm smoking, but it must be good, because nobody would have imagined it. But at 8:30 the next morning, it became reality and our lives changed forever." Steven Hess will be speaking Thursday, April 18, at Finger Lakes Community College at noon in the Student Center auditorium. Click on the LISTEN link above to hear an interview.